The hazard warning flasher serves as a warning to other drivers to exercise extreme caution when approaching, overtaking, or passing your vehicle. It should be used whenever emergency repairs are being made or when the vehicle is stopped near the edge of a roadway. 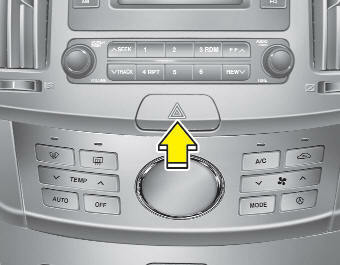 Depress the flasher switch with the ignition switch in any position. The flasher switch is located in the center console switch panel. All turn signal lights will flash simultaneously. The hazard warning flasher operates whether your vehicle is running or not. The turn signals do not work when the hazard flasher is on. Care must be taken when using the hazard warning flasher while the vehicle is being towed.